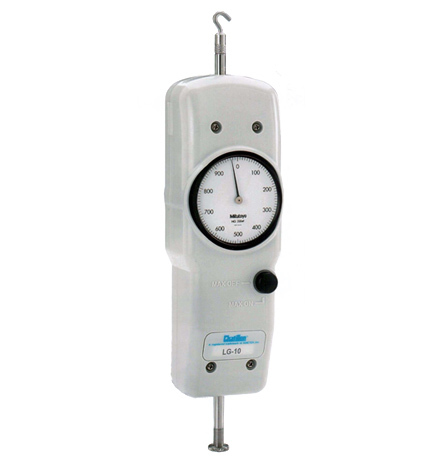 The CHATILLON® mechanical force gauge is ideal for a wide range of force testing applications. Based on our popular DPP Series force gauge, the LG Series features a larger, 2.25-inch dial for improved resolution and readability, peak hold button, ergonomic shape and improved accuracy of +0.5% of full scale. The LG gauge is an excellent, economical solution for tensile or compression testing. Use handheld for a "go"/"no go" check of switch operation. Use handheld and apply a pulling force to disconnect cables and hoses and record maximum necessary tension. Mount on a Chatillon MT test stand to check the necessary compression force to engage a breaker.